My university tutorial yesterday covered selective reductions of functional groups in organic chemistry. My thoughts on that topic have now morphed into something rather different. Scientific research has a habit of having this sort of thing happen. After I completed the blog post (deliberately done whilst the memory of the tutorial was fresh on my mind), a thought then struck me. I appended a new idea to the post in the form of a comment (the actual posts themselves I feel should remain resolutely unmorphed; I tend to correct only typographical and minor errors). I had spotted that the adduct between ethanoic acid and borane had a very short H…H distance. So the obvious thing to do is to see if one might tweak the structure to further enhance the interaction. Hence below. 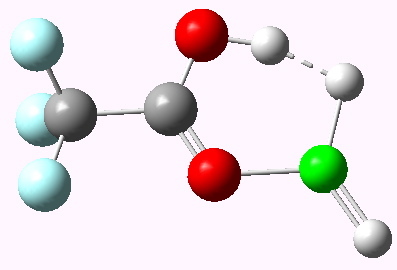 The interaction of interest is between an acidic hydrogen and the hydridic one. The former can be acidified further by employing trifluoroethanoic acid. The latter can be tweaked by replacing boron with beryllium. 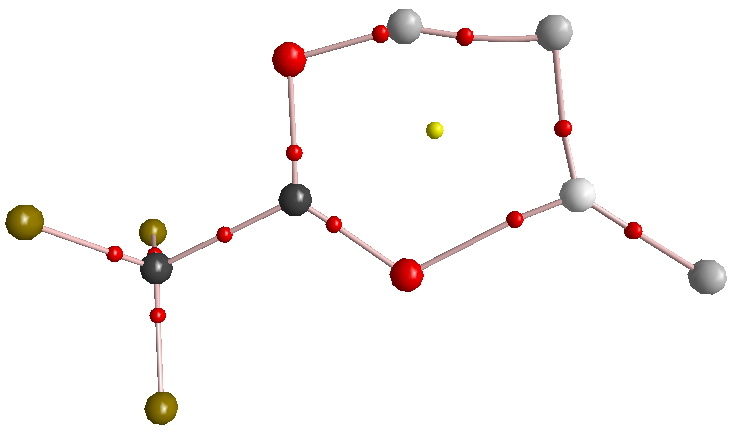 This newly designed molecule now exhibits a H…H distance of 1.278Å (ωB97XD/6-311G(d,p) calculation), which as these so-called dihydrogen bonds go is pretty short (H2 itself is ~0.74Å). 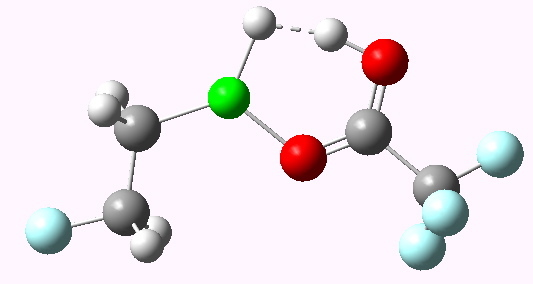 Normal dihydrogen bonds (see for example my lecture course) are in the region of 2.0-2.2Å, although a few crystal structures (e.g. WAGBAH in the Cambridge database) have shorter B-H…H-O distances of around 1.76Å. A typical H…H van der Waals distance is ~2.4Å. So it appears that H…H interactions can be almost continuously tuned across the whole range of short covalent, to short and medium dihydrogen and long dispersion lengths. The AIM analysis (below), shows ρ(r) to be ~0.07 au for the bond-critical-point spanning the H…H region. Normal hydrogen bonds rarely exceed 0.04, although it’s still some way off a covalent H-H bond value (0.26). Could the molecule above be made and characterised? Well, it is probably the case that as the H…H distance gets shorter, so the activation barrier for actually eliminating covalent H2 will get smaller and smaller. Probably, distances of ~1.7Å represent the shortest that actually has a reasonable barrier preventing such eliminations. With the current interest in devising materials capable of storing H2 (and absorbing/releasing it on demand), these types of molecule may perhaps prove useful. Quite a way to come starting from a tutorial on diborane reductions. This entry was posted on Thursday, December 2nd, 2010 at 8:46 pm and is filed under Interesting chemistry. You can follow any responses to this entry through the RSS 2.0 feed. You can leave a response, or trackback from your own site. I introduced into the above post the idea of tuning the structure. It turns out this is a remarkably tunable system. One can control the H…H distance quite finely with even quite remote substituents. However, at the shorter extreme, the system becomes almost chaotic. At H…H distances of less than 1.26Å, the geometry collapses with extrusion of hydrogen gas. Thus in the above structure, if the Be-H substituent is replaced by eg B-Me or Be-Et, such collapse occurs. But further fine tuning produces the below, which has a H…H distance of 1.268Å, which is the shortest I have been able to achieve without collapse. These two posts do illustrate how it can be possible to tune a bond almost continuously between a bond order of one and zero. We normally assume that bonds tend to cluster around integer bond orders, and that only small tunings around these bond orders are possible. These compounds suggest that this long held assumption may not always hold.